Less than a week after Pyongyang defied the international community with a third nuclear blast South Korean sources allege that one day prior to the blast and despite increased scrutiny, North Korea tested a long-range missile engine. Quoting unnamed South Korean officials, Yonhap News Agency reported on February 17th that Pyongyang had carried out a combustion testing of the engines for the intermediate-range KN-08 missile at the Dongchang-ri launch site on February 11th, with the aim of extending the range of the missile beyond 5,000 km, as well as be able to deploy them. Military sources said the engines were intended for a new intercontinental ballistic missile (ICBM). Despite frequent references to the missile as an ICBM, analysts doubt that at 18 meters long and 2 meters in diameter, the liquid-fuel KN-08 is large enough to carry enough propellant to attain such a range (that is, >5,500 km) — at least based on current North Korean technology. The alleged test may therefore have been intended for a larger-sized variant of the KN-08 IRBM. Given that North Korea was under intense international scrutiny over its plans to detonate a nuclear device, Pyongyang was fully aware that the test would be detected by U.S. surveillance satellites. Analysts say North Korea may have therefore carried out the test to raise U.S. and its regional allies' concerns over Pyongyang's growing capabilities. Alternatively, some suspect North Korea was signaling to the U.S. and its allies that it would test the missile if additional sanctions were put in place following its nuclear test. During the centenary celebrations of Kim Il-sung’s birth on April 15, 2012, Pyongyang unveiled a road-mobile launcher — purportedly made in China — outfitted with what were presumably KN-08 mock-ups. In January 2013, U.S. intelligence agencies claimed they had evidence showing that North Korea was moving mobile launchers around the country. However, the ongoing engine tests, added to the fact that the North has yet to test-fire the missile, would indicate that the KN-08 is not yet ready for operational deployment. The road-mobile launchers, therefore, may simply have been decoys meant to throw off U.S. satellite imagery, a strategy that Pyongyang’s ally China, among others, has embraced. Still, the time when the KN-08 becomes operational may be approaching. North Korea has carried out numerous tests related to the missile over the past two years. A South Korean source said Pyongyang could now be closer to deploying the KN-08 if it judges that the supposed test earlier this month was successful. Key to this will be Pyongyang’s ability to couple nuclear-tipped intermediate- or long-range missiles with road-mobile transporter-erector-launchers (TEL). 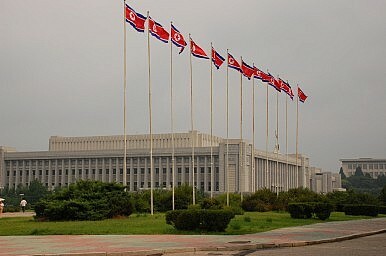 Earlier this month 38 North reported that work at the Tonghae Satellite Launching Ground (aka Musudan-ri) pointed to the possibility that Pyongyang may be making preparations for an upcoming test of a liquid-fueled rocket, which media have speculated could be the KN-08 or the intermediate-range Musudan (BM-25). Both missiles can be launched from TELs or fixed platforms. Still, analysts at 38 North— which is run by the U.S.-Korea Institute at John Hopkins University’s SAIS—cautioned that available satellite imagery doesn’t allow them to conclude that the ongoing work is a sign that Pyongyang is readying to test-fire the KN-08 there anytime soon. The institute also claims that some of the ongoing construction at the site is similar to components of a new launch pad at the Semnan Space and Missile Center in Iran, which could provide further evidence of Iranian assistance in North Korea’s missile program. Japan’s Kyodo news also reported last week that Iran sent North Korea a proposal last fall offering it millions of U.S. dollars (denoted in other currencies) to send observers to North Korea’s third nuclear test. Photo analysis by 38 North in late 2012 also showed that construction was ongoing at a launch pad at the Sohae Satellite Launch Station on the northwestern coast. The North is believed to have conducted as many as three tests of large liquid-fueled, first-stage rocket engines at Sohae in 2012 for its Unha-3 rocket— which Pyongyang claims it successfully launched on December 12, 2012 — or the KN-08. Although Pyongyang maintains that the Unha-3 is a satellite launch vehicle, opponents believe it is an ICBM, with an estimated range of 10,000 km. Analysts believe the North Koreans are currently enhancing the upper gantry platform at Sohae to make it capable of launching rockets or missiles larger than the KN-08 or the Unha-3. The intelligence on a regime as closed as Pyongyang remains less than optimal, and as such it is always difficult to truly comprehend what North Korea is up to, much less ascertain the rationale behind its actions. What is clear, however, is that Pyongyang’s belligerence under Kim Jong-un does not suggest he will be any different than his father, which bodes ill for future regional security.